than government can fulfill this need. quality education, we are reducing such access in a variety of ways. attempts to respond to the problem. local property taxes, even if specifically designated for schools. difficult to cull poor teachers. good math and science teachers. is dead. That will be dangerous. 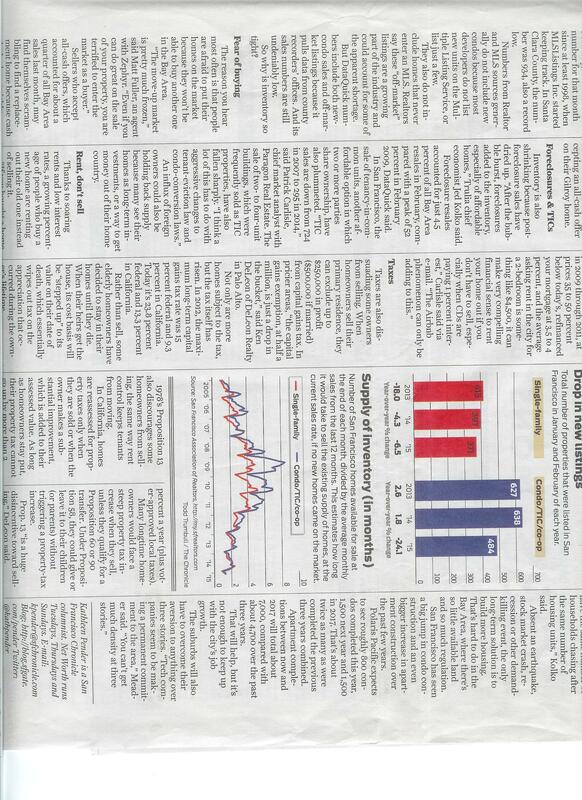 Note: This was published in the Mercury News Newspaper in August of 2008. A recent Field poll of California citizens indicated substantial majorities had a positive view of Proposition 13, the law which severely limits property tax increases except when real estate changes hands. This poll was like asking people if they would like to see their taxes increase, without pointing out what the additional government revenue might be used for, or what the unintended consequences of Proposition 13 have been. For example, no mention was made of the fact that California now spends less than half of the amount per pupil on its public schools than New Jersey. California public schools generally have serious problems, including an unacceptable drop-out rate. The shortfall in funding can be traced largely to Proposition 13. The great resulting tax disparity can be found in a middle upper class neighborhood here in Northern California. On a West Valley dead-end cul-de-sac sits eleven homes. Six families are pre-Proposition 13 taxpayers that pay a total of $14,200 worth of annual property taxes. The other five pay $125,000. Average age of six original owners is 77, whereas the other five is age 50. Most people are unaware that, in addition to protecting single family residential property from sharp property tax increases, Proposition 13 also shelters industrial and commercial property. Generally speaking, property owned by a corporation or partnership will not be reassessed until more than 50% of the ownership of the corporation or partnership changes hands. Careful planning can avoid such ownership changes for many decades, even after some of the shareholders or partners die. Even more startling, if real property was owned by a corporation or partnership prior to the passage of Proposition 13, it will never be reassessed, barring a sale, unless there is a shift of control of the corporation or partnership to a single individual or a single entity. That means, for example, that property owned by PG&E prior to the Proposition 13 passage will essentially never be reassessed, since no one person or entity is likely to ever gain control of PG&E by owning more than 50% of its stock. All of this means that there has been a steady shift of the property tax burden from commercial and industrial property to residential property, while at the same time our schools have been starved of revenue. There are two additional pieces of Federal and State legislation that when combined with Prop 13 keep millions (especially seniors) of homeowners in their homes. 1. Prop 13 causes seniors who want to move to a less expensive, smaller home to face a steep increase in property tax, except in a few counties. 2. Capital gains (Federal 15% and State 9.3%) are often above the $250,000 per person exemption when sold. Seniors pay the capital gain tax no matter where they move. Assisted living can have heavy up-front fees. 3. The third piece is the ‘current surviving spouse’s’ best friend. It’s the ‘Stepped-Up-Basis-at-First-Death’, part of the current Federal tax legislation. A surviving spouse gets a ‘Step-Up’ on both halves on all ‘community property’ assets, and pays no capital gains tax on a sale following the death of his or her spouse. A home purchased for $50,000 in 1965 and sold for $2,500,000 in 2008 can have two different results when sold. A current surviving spouse pays zero. A couple selling would pay $400,000 to $500,000, depending on improvements. Few seniors are aware of the legislation. Assisted living facilities are full of the elderly who paid capital gains plus a large up front fee to get into a retirement home. 1. Seniors over 65 should be allowed to move anywhere in California without paying increased property tax, as long as they are moving to a less expensive residence. 2. Prop 13 protections should be gradually removed from commercial and industrial property, allowing our schools to be better funded and stopping the property tax burden from shifting to residences. 3. Capital gains taxes should be completely removed for sale of a residence by seniors over 65. 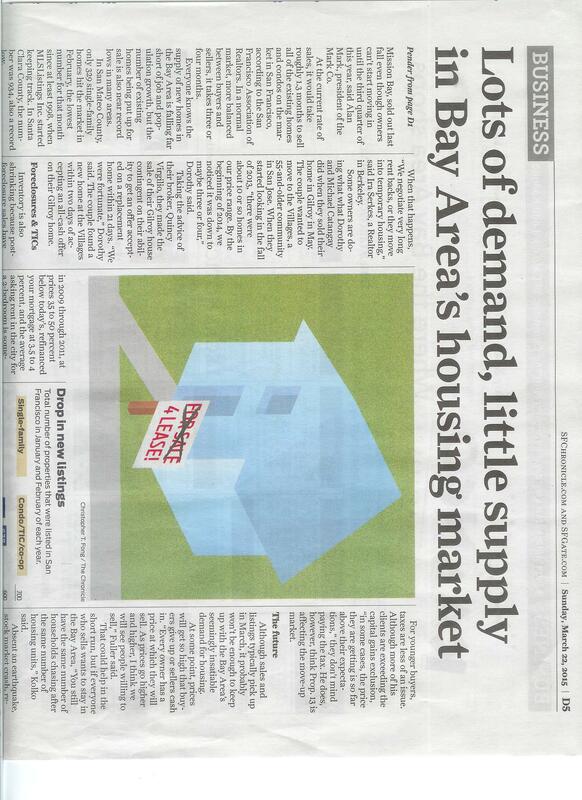 Attached is the copy of the article in the Mercury News. A direct frontal attack to change Prop. 13 (Editorial, Feb. 10) requiring a two-thirds vote won’t work. 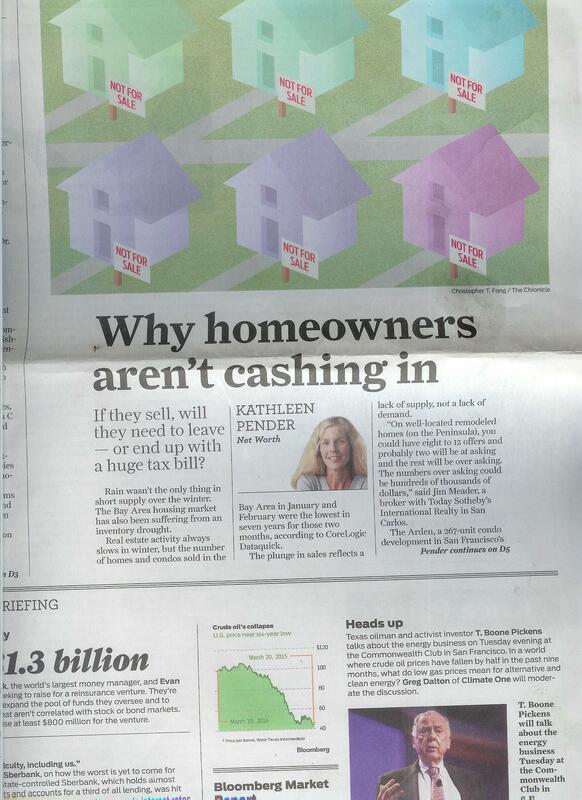 There are too many home and commercial property owners benefiting from a very low property tax base. The unfair federal and state “step-up basis” benefiting a surviving spouse versus couples living close needs to be addressed separately from Prop. 13. There are millions of couples over 65 and much later in life who won’t sell because the capital gains tax exemption of $250,000 per person is too low. The lock-in effort slows middle to high-end properties for sale, thereby creating a huge restriction on increasing property taxes both on home sales and commercial property. It would require federal legislation and not the state two-thirds to change Prop. 13. Research shows that when the exemption increased from $125,000 per-person to $250,000 (1992) sales increased substantially in that bracket. My recommendation is an end-run around Prop 13 to increase property taxes. 1. Increase property tax revenue substantially over time without a direct confrontation with Prop 13. We expect this would occur because senior couples over age 65 would have a capital gains tax barrier to selling their homes removed. We believe their moving might cause a new buyer, paying current market value property taxes, to then occupy the home. The larger purpose, however, was the one listed below. 2. Overcoming a huge inequity for elderly taxpayers only, which is the Federal unfairness in application of the ‘Step-Up-Basis-at-First-Death’ (no matter what age.) By allowing all seniors over 65 to sell their primary residence and pay no capital gains, they would receive the same capital gains tax treatment given to surviving spouses. Since surviving spouses pay no capital gains in immediately selling their primary residence, whereas couples face a large capital gains over the $250,000 per person exemption, couples are second-class taxpayers to surviving spouses. We were primarily attempting to resolve that inequity!